Rosin Eyecare has been a staple of the Chicago eye care community for over 80 years. Founded in 1930 during the Great Depression, Rosin Eyecare has never wavered in its mission to provide high-quality vision correction and eye disease management for the people of Chicago. 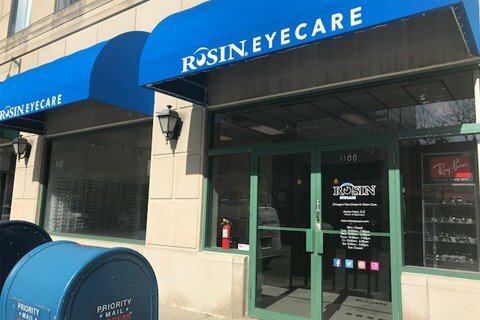 Now with over 40 convenient locations, Rosin Eyecare is almost always in your neighborhood, ready to care for your eyes! Our Oak Park location offers the community professional eye care services, experienced optometrists, flexible weekend hours, and compassionate treatment for the total Rosin Eyecare package. Your Oak Park optometrist offers complete eye care services, such as comprehensive eye exams, vision correction through eyeglasses, contact lenses or LASIK, treatment for eye conditions like dry eye and digital eye strain, and eye disease prevention and management for glaucoma, conjunctivitis, cataracts, and more. Our Oak Park eye care services can support your entire family’s eye health, and we love being able to give our fellow Chicagoans the clear vision and healthy eyes that are so important to their day to day life. Your quality care at Oak Park begins with an in-depth eye exam that is so much more than simply reading an eye chart. We not only include routine vision tests to get your glasses or contact lens prescriptions, we also test for eye diseases, color blindness, diabetes and aging eyes, and any other eye conditions that can cause you blurry vision or discomfort. Our Oak Park eye doctors use your eye exam and your family history of eye diseases to work with you to design an eye care treatment plan that takes into account your vision needs and your overall eye health. Our Oak Park eyeglasses selection will help you find those frames that speak to your personal style. We stock frames for men, women, and children, as well as frames that fit a variety of lifestyles. We have safety glasses for those who are in a rough work environment, sports glasses for the athletes, blue light protection for those who use digital devices frequently, and even frames for simple, everyday use. Call us today at (708) 383-7240 to schedule your next appointment or stop by your Rosin Eyecare doctor located at 1100 Lake St Ste 180 in Oak Park. *From the East: From Garfield Park Conservatory take Lake St west then turn left onto N Hamlin Ave. Continue past Garfield Park where you will take a right onto Ida B. Wells Dr. Take the ramp on the left onto I-290 W passing Michele Clark Magnet High School and Columbus Park. Use exit 21B and turn right onto IL-43/Harlem Ave. Continue north and turn right onto Lake St where you will find us located on the left next to Potbelly Sandwich Shop. *From the North: Take W North Ave west past Wonder Works Children’s Museum. Turn left onto Harlem Ave and head south towards Walter Gerts House – Frank Lloyd Wright. Take Lake St east and we will be located on the left next to Chicago Title.